Congratulations to Antoine L’Estage and better luck next time Frank Sprongl (my bet). The North Toronto Collegiate Institute land swap, in which the school swapped land with the developer Tridel to allow them to build two condos on their land if they also build a new school, is an example of public officials being resourceful, not selling out. Here’s the CBC article. Recently I mentioned to Lindsay that I was thinking of running for our condo-board president on a platform of being the first socialist condo board and doubling our condo fees in order to start a local daycare and to use one of our homes as a homeless shelter. That campaign has yet to begin. Despite my own plans, I like this North Toronto Collegiate Institute plan. The specifications for the condos were drafted by the communities involved then given to Tridel (not argued over after it was proposed by the developer); the new school will not be named after Tridel and there is no other synergistic nomenclature in use, and the TDSB will continue to build new schools that only meet the highest standards for energy use. The government should be building schools and can’t abdicate this role to the private sector, but this is a good move. Real estate, education, health and safety, city planning, etc. all converge on the issue of building schools and their is no single solution and assuming that the money to build schools can only come from one source does not reflect the complexity of the issue. This plan is good for central Toronto and demonstrates that the TDSB is creative, reasonable and not full of ideologues. I can only assume this demonstrates the best meaning of “running government like a business” (as opposed to its most common meaning: “I don’t care how crapy things get, I’m not paying my taxes”). 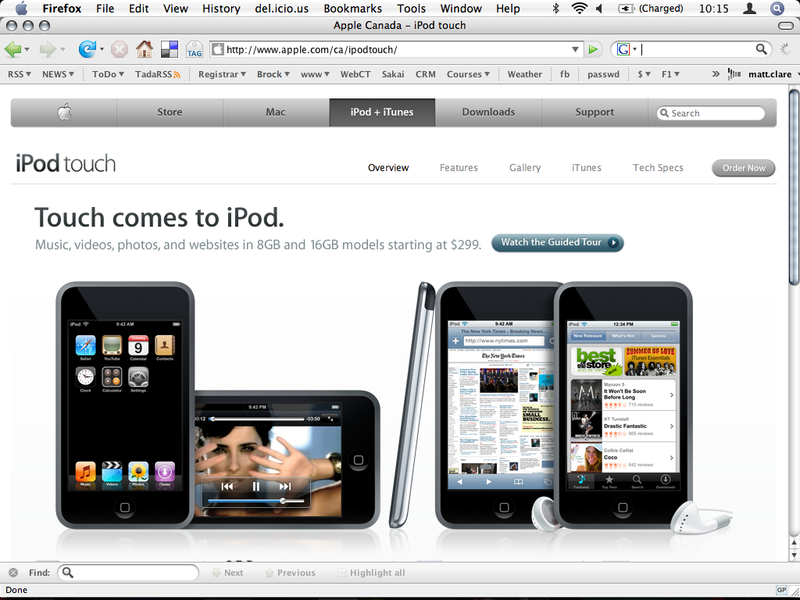 I’ve been watching Apple’s web site hoping for an iPhone in Canada and debating getting the Wi-Fi enabled iPod Touch. Something I noticed today is that the Apple Canada web page for the iPod Touch (www.apple.com/ca/ipodtouch) reads “Music, videos, photos, and websites in 8GB and 16BG models starting at $299″ but when you press the “Order Now” button the Apple store wants to charge “$329″ (again in the Apple Canada store). $299 is the American price, and probably where this image on the Canadian web page came from, b this is a $30 price increase in a situation where the exchange rate would suggest a $30 decrease from the American price. .. and a PDF print out here. 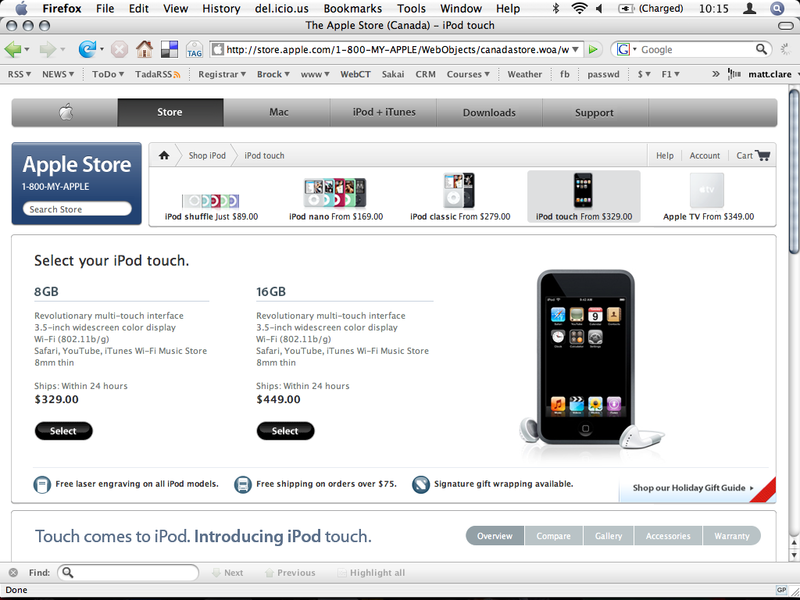 The web page at www.apple.com/ca/ipodtouch/ (the Canadian web site’s link for the iPod Touch) states “..starting at 299″ but when one clicks the “Order Now” button the store lists the 8GB iPod as $329. I called 1800myapple and 18006927753 and was not able to purchase the iPod Touch at 299 (in US funds because I am in Canada, and in Canadian because “their system wouldn’t allow it”). I know that you are not bound by the Retail Council of Canada’s price advertising laws, but I feel that you should pay more attention to these issues given the current price sensitivity in Canada because of the loonie-to-dollar exchange rate. UPDATE: Looks like it’s fixed! I assume that means that Apple reads their feedback messages. You are currently browsing the iMatt :: The Blog of Matt Clare weblog archives for November, 2007 .